With its assortment of fall flowers, cattails, fresh apples and miniature corn, this beautiful cornucopia will add great taste to any table setting. 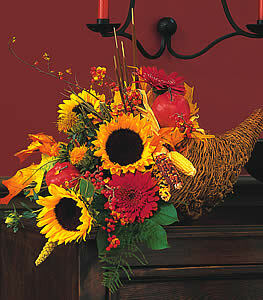 Gerberas, sunflowers, cattails, miniature Indian corn and fresh apples arrive in a wicker cornucopia. As a satisfied customer with your service I am writing to say thank you. The item ordered was great and received on time to my family for the holiday. Again, thanks for a service well done. I will surely recommend your services to friends and family.